This region has long been noted for trophy fish and game. There are more muskies than ever, and because of catch and release, large fish are even more common. Walleye, Crappie and Bass fishing is excellent. Fishing and hunting licences are available right in our store. Don't forget your outdoors card, even if its expired. We are happy to issue your licenses. 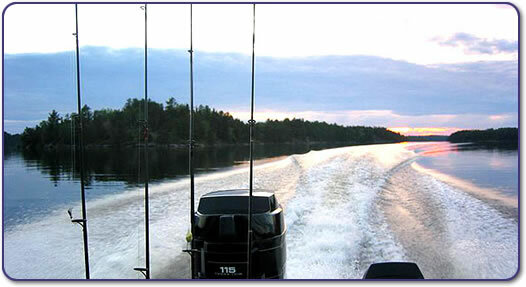 Walleyes, Lake Trout, Smallmouth Bass, Northern Pike, Perch and Crappies are all found in good quantities. Lake of the Woods being so vast and diverse, you can explore different shoreline and structure every day, and you never have to fish around others . Lake of the Woods is a relatively safe lake because of its character with over 14,000 islands and many channels and bays ensuring that you need not encounter "big water." 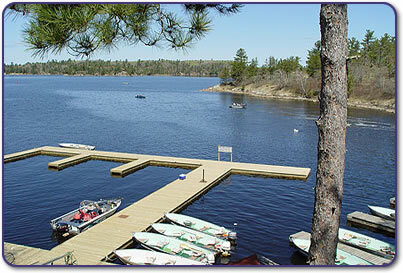 Our newly renovated docks are located beside the falls. We have both mixed and unmixed gas and our dock men will make sure you are well equipped for a day on the lake. Take a boat by the week and our attendants will keep it gassed and ready to go when you need it. If you wish to bring your own boat, there is a small daily charge for the use of our dock facilities, and launch ramp fees are included. We have an excellent float plane service available near by. These people will take you for a unique day's fishing experience and pick you up in the evening to return you to camp. They have boats in a number of secluded lakes. For owners of private wheeled aircraft our community airstrip is located about one mile from camp. It is approximately 4,000 feet of recently paved runway and is adequate for up to medium twin engine aircraft. When you stop for customs, phone us and we will be happy to pick you up at the strip. Coming to Canada is relatively easy - we suggest your bring personal identification such as a birth certificate, passport or other picture ID. Passports are recommended to return to the US. Long guns may be brought in for hunting, but handguns are not allowed. For the greatest sport of all, don't forget to bring your camera and equipment...we have all kinds of amazing scenery. Here you are in an area offering every conceivable opportunity for every class of photography...still and movie...wildlife and woodland and water...personal videos...thrilling still-life shots. No closed season for northern pike. Walleye season opens third Saturday in May. Muskies third Saturday in June. Lake trout season January 1 to Sept. 30. Bass--catch and release January 1 till June 30th. (Lake of the Woods and Kakagi Lake). Hunting opens in September for Grouse and migratory birds. Geese are also becoming more plentiful. Deer hunting gun season starts in early October.